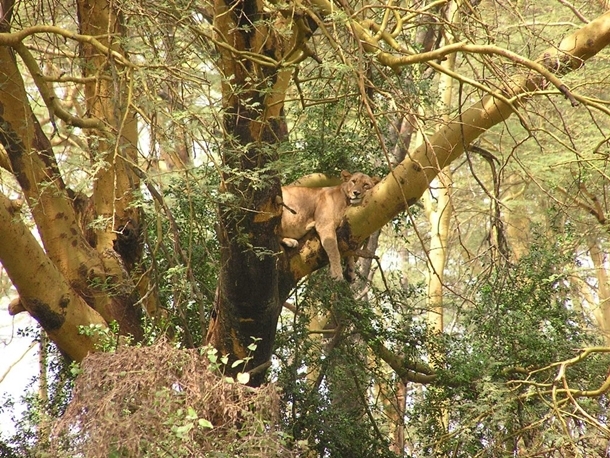 Sammy, one of our guides in Kenya, has just won our Guides’ image of the month competition with a sensational shot of a lioness relaxing in a tree.Sammy had heard that the lions in Nakuru were going up into the trees to escape the extremely high lake which is encroaching on the park drastically at the moment. He considers himself very fortunate to have spotted this lioness as he came around the corner, eyes peeled up into the trees. We like the way the lioness is draped in the boughs – she looks so comfortable and slightly sleepy! All the winning monthly images from our guides will be posted here and on Facebook with one of the twelve monthly winners being awarded a prize of $250 at the end of the year. Well done Sammy.